An eye-witness account of everyday life in Israeli occupied Gaza in 1982. On Friday, 9 April 1982, uniformed Israelis shot at worshippers outside the al-Aqsa mosque in Jerusalem. This incident triggered off a wave of protest throughout the occupied territories. In the Jabaliya refugee camp in the Gaza Strip, just north of the town of Gaza, Israeli soldiers used firearms to disperse the demonstrations. Seven-year-old Suhail Ghabin, who was playing in the sand with his eleven-year-old sister, was hit by a bullet and seriously wounded. Unlike the demonstrators, who were aware of the danger and could try to seek shelter or flee, the children playing in the sand were sitting ducks. A Red Crescent ambulance called to evacuate the boy was stopped by the Israeli occupation authorities; and when finally the ambulance was allowed through, it was too late. Suhail died on the way to hospital. In cases of this kind, the occupation authorities try to take possession of the body in order to prevent a public funeral. A secret burial is arranged in the middle of the night, under heavy military supervision and attended only by a few close relatives of the deceased. Suhail’s family, guessing the authorities’ intention, hurried to the mortuary and stole his body. A public funeral was held. Thousands of people came out of their homes and walked towards the military compound. According to eyewitness reports, it seems as though fear had been transcended: women clad in black mourning attacked soldiers with their bare hands. Little children ran up to the patrolling jeeps and, baring their chests, teased the soldiers, ‘Shoot me! Shoot me!’. Old tyres, which are normally used by the refugees to weigh down the roofs of their huts and which the military had scrupulously confiscated a few days earlier and placed in a large heap inside the military compound, were set on fire by youths who managed to infiltrate the compound. The soldiers responded by shooting at the crowd and at the water tanks on the roofs of the huts – a common practice designed to punish the refugees by stopping their water supply. At the end of this round of shooting, curfew was imposed on the camp. The Gaza Strip begins some twenty minutes’ south of the Israeli town of Ashkelon, at a road-block. A road-block is a rolled barbed-wire fence, or a strip of metal with protruding spikes stretched across the road. Beside this particular road-block, at the northern entrance to the Strip, under a large tent, sit four or five soldiers – border-guards and reservists – who supervise the entry and exit of vehicles and people travelling on this road. A road-block, as every Israeli Jew and every Palestinian Arab knows, has one purpose: to distinguish, to discriminate, ultimately to set apart. The road-block is directed at Palestinians, it is there to scrutinise them, to exercise power over them. A Palestinian is firstly distinguished by the licence plate of his or her car; it is blue or grey (while Israeli vehicles have yellow plates) and bears a Hebrew letter denoting the locality where it was issued – R for Ramallah, N for Nablus, G for Gaza. A Palestinian is, secondly, distinguished by name: an Arab name in an identity card sets the bearer apart as the sought-for object of scrutiny. Thirdly, the identity card distinguishes between religions – Jew, Muslim, Christian – or, in the more familiar binary classification: Jew and non-Jew. In Israel there are officially no Israelis – only Jews and non-Jews. A Palestinian is also identified by appearance: poverty, sweat and dirt, rotting teeth and matted hair, clothes in assorted third-world colours mark the Oriental manual labourer after a day’s work – the Turk in Berlin, the Algerian in Lyon, the Palestinian in occupied Palestine. The road-block encounter should not be construed as a symbol of occupation, neither should it be seen as an isolated facet of daily experience; for it is that experience, it is the truth of occupation. The road-block is a paradigm of power which undergoes many transformations yet remains the same. In it the Palestinians are not merely distinguished by number-plate, name or appearance; they become that number-plate, that name, those clothes. Abu Salam from Rafah does not possess a blue number-plate, nor does he bear and display an ID card with his name. In the road-block encounter, he is that blue number-plate marked with an ‘R’, or that official piece of paper. A few kilometres past the road-block – through which my friend and I, being Jews, were allowed to pass on the nod – the driver has the choice between following the road straight through the town of Gaza or using the bypass which goes round the town and rejoins the straight road further south. Road planning in Israel aims at bypassing areas which are predominantly inhabited by Palestinians. When driving from Haifa to Tiberias, for example, one could never tell that one is passing through a district whose population is predominantly Palestinian (the Galilee). Arab villages appear in the distance on the mountain slopes, rarely alongside the main road, as quaint reminders of the Galilee’s rusticity. Road signs hardly ever display directions to Arab localities. The same principle guides road construction in the territories occupied since 1967. A cursory glance at the map of projected settlements and roads in the West Bank reveals the intention. A Jew living in Gush Segev, a settlement block in the northern part of the West Bank (‘Samaria ‘), will soon be able to drive to Jerusalem or Tel-Aviv without going through Nablus and Ramallah and without meeting a single Palestinian. At the same time, a Palestinian wishing to go from Hebron to Bethlehem will have to travel right through Jewish towns such as Efrat. He will be forced to see occupation. The colonisation network and road grid in the occupied territories are designed so as to make Palestine invisible, and the Palestinians objects for inspection and scrutiny. This is why ‘Judea’ and ‘Samaria’ are not merely the names given by Israel to the north and south of the West Bank; rather, they denote an object distinct from the West Bank. The Gaza bypass was designed for the Jewish settlers of the Rafah enclave and of Gush Qatif in the southern end of the Gaza Strip. We drove into Gaza town. It has been compared to Pakistan, to North Africa. ‘This place looks like the Third World,’ remarked an Israeli friend who recently accompanied me through the streets of Gaza. He was referring to the ubiquitous poverty, heat, dust, sand and colours that range from yellow-brown to grey. Our hosts, to whose home we promptly drove, did not conceal their distress at the recent deterioration of the situation in occupied Palestine: The ‘bestialisation’ of the Israeli military – as a major Hebrew daily recently called the wanton brutality increasingly practised by the forces of occupation – was the first topic of our conversation. Our hosts were agitated, yet spoke calmly in a measured tone, citing examples such as the one reported above. In the Shati camp in Gaza town, Israeli Shin-Bet officer ‘Abu Sabri’ drove past a burning tyre. (Shin-Bet officers customarily decorate themselves with Arabic noms de guerre by which alone they are known to their Palestinian subjects.) He stopped, got out of his car and, finding no-one around who might be ordered to extinguish the fire, he rolled the burning tyre, pushing it with a stick towards the nearest house. He then opened the door and rolled the tyre onto a mattress on which a man was lying asleep. The victim, a family guest, woke up to find his blanket on fire, and threw it off while ‘Abu Sabri’ watched calmly. ‘Abu Sabri’ then opened a wardrobe, rolled into it the still burning tyre, closed the door and departed. In Khan-Yunis, one quarter of the refugee camp was placed under curfew after a gun had allegedly been stolen from a soldier on duty. 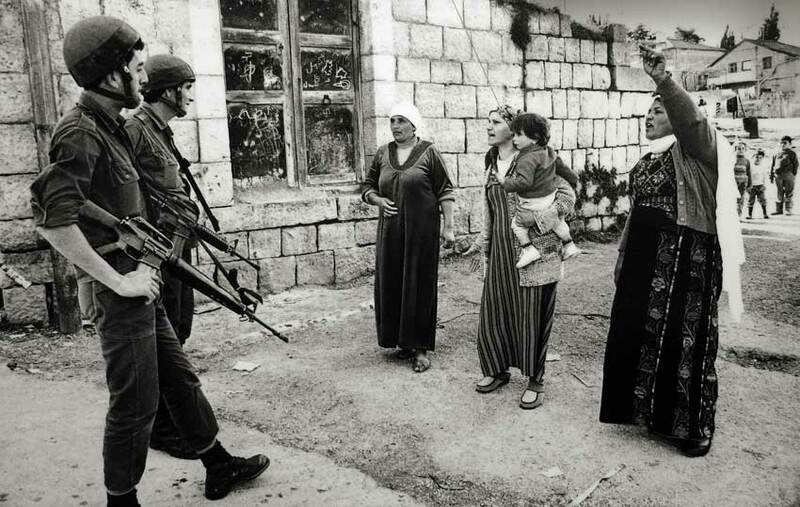 We were told that this is what had really happened: a group of women surrounded the soldier, disarmed him and forced him at gunpoint to shout pro-Palestinian slogans. Then they let him go but kept his weapon. In the years 1967-72 the Gaza Strip had been the main centre of Palestinian resistance to Israeli occupation. It was ‘pacified’ by Ariel Sharon, then military commander of the area. In an intensive counter-insurgency operation, during which tens of people were killed and hundreds jailed, Sharon brought to an end a situation in which ‘the IDF ruled by day, the PLO by night,’ as Gazans put it. Although active popular resistance had largely been suppressed, resentment against Israeli rule remained as powerful as ever. Israel’s recent attempt to enforce the ‘autonomy’ plan – a regime of collaborators propped up by Israeli bayonets and bribes – was the match that reignited the flame of resistance. This in turn has been met with a terrifying avalanche of repressive measures. Nine days have elapsed since the curfew was imposed on Jabaliya. For the ninth successive day forty thousand people have been shut up in their homes, allowed out for two hours in every twenty-four in order to buy food. The catch is that no supplies are allowed into the camp and the local shops were emptied during the first few days of the curfew. Jabaliya is the largest Palestinian refugee camp in the area, numbering 40 to 45 thousand inhabitants according to UNRWA estimates. It is the only refugee camp with an Israeli military compound in the middle: a whitewashed edifice dating from the British Mandate period, surrounded by several rows of barbed-wire fences. Four tanks and a few jeeps are parked in the enclosure. Machine-gun barrels protrude from between the sandbags heaped on the roof and window sills. An Israeli flag flies from a tall pole on the roof: the symbol of the liberated Jewish people in its homeland. As a child I lived in Jerusalem. On Saturdays I would go for walks with my father and see the border fence which, before 1967, ran between the west and east of the city. My father is not a militarist and at home I was never taught to regard Arabs as enemies. But I recall so well the sight of the Jordanian Legion border-guards, the barrels of their rifles protruding from between the piles of sandbags on the roofs and window sills of buildings along the other side of the fence. I knew they were my enemies; I read their hostility in that sight of sandbags and weapons. Uniforms and guns and sandbags speak a language which every child can understand, the more so when they are directed against him. We wanted to enter the Jabaliya refugee camp, but were not allowed in. We tried the three entrances to the camp but finally had to settle for a view, from the outside, of a road-block encounter. Barbed wire and soldiers with a smattering of vulgar colonial Arabic arguing with various people who were trying to get into the camp. The curfew had been imposed by order of the local commander, with immediate effect; so many Jabaliyans who were not in the camp at the time were not allowed to return to their homes during the nine days. On top of this, if found outside the camp in the course of a routine identity check, Jabaliyans were liable to pay a heavy fine for… breaking the curfew. Therefore many Jabaliyans, workers and students, who happened to be outside when the curfew had been imposed, were left with the choice: either stay out in hiding at the home of a friend or relative, or try somehow to get back on. In a sense, curfew is the opposite of a road-block. While the latter sets the Palestinians apart and trains the spotlight of power upon them, curfew throws the spotlight onto the holder of power himself. The only people to be seen on the street are the soldiers, patrolling, checking that order is maintained, that the Palestinians stay confined in their houses. Here power displays itself, shows its muscles and turns the Palestinians into spectators, a passive audience. At about 4 pm the curfew was lifted for two hours. People streamed into the streets. Children, having been penned in all day, ran out to play. Although the curfew was suspended, the camp remained sealed – no-one was allowed in or out. Since food supplies were running low, and in some cases were exhausted altogether, many women used the chance of the recess to sneak out of the camp through the cactus thickets, and made their way to the nearest grocery shop outside the pale of Jabaliya. We saw them walking fast, almost running, the grocery bags on their heads, trying to keep off the main paths where they could be spotted by the occasional military patrol. The women were helping each other along, while people on the street were constantly on the lookout for Israeli patrol jeeps, sounding an alert whenever they spotted one. The sense of solidarity displayed here is very different from the ideology of cooperation and social solidarity inculcated in the Israeli youth movements, an ideology which is part of the Zionist myth of the pioneering spirit. As an adolescent in post-1967 Israel, I had always regarded this spirit with suspicion. It seemed to me to be a politically manufactured myth, a piece of (possible) history transformed into a virtually official ideology. Standing outside the road-block at the entrance to the camp, I realised that what makes their type of solidarity real for these Palestinians is the fact of occupation, the experience of oppression. The consciousness of unity among Zionists is formed by the collective memory of persecution, while the uniting principle for the Palestinians is the reality of living under occupation. Paradoxically, occupation enslaves the Israelis by making them dependent on ideology, while it liberates the Palestinians by grounding their experience in social realities. We spent the day in Rafah, which in a few days’ time would become a border town between the Israeli-occupied Gaza Strip and Egypt. Rafah is much smaller than Gaza and the local refugee camp intermeshes with the town in such a way that it is hard to tell where the one ends and the other begins. We followed the Israeli armoured vehicle in its provocative glide down the main street. The four soldiers on it were helmeted and heavily armed. The machine-gun mounted on the vehicle was pointing at the pavement. The armoured jeep came to a gradual halt outside the mosque, just when the worshippers were coming out. I tried to imagine how they must feel, coming out of the mosque into the firing range of a deadly weapon. Later that day we learned that a week earlier the soldiers fired directly into the mosque while the people were still inside. We were shown the bullet holes in the walls. Some friends took us on a tour of the ‘Canada’ camp. This camp was constructed by the Israelis several years ago, after they had bulldozed entire sections of Rafah in order to widen the streets and facilitate counter-insurgency operations. Rafah camp residents were allowed to move into the shacks erected in an area which in the years 1956-1967 had been used by Canadian units of the UN force. This is how the new camp got its name. Some five hundred refugee families presently live there. The problem for these ‘Canadians’ on 23 April was that their camp was actually in that part of Rafah which in two days’ time was to be handed back to Egypt. As late as Friday, the residents had not been notified what their status would be as of the following Sunday. They had no guarantee that they would be able to cross from Rafah (Egypt) to their workplaces and schools in Rafah (Palestine). Neither were they sure that the Egyptian government would accept them. A feeling of helplessness was conveyed by the people we spoke to. The border fence, newly erected and prepared for the final ceremony of withdrawal, put ‘Canada’ on the Egyptian side. In a few places the total lack of concern for the inhabitants stood out in all its absurdity. For example, four families whose houses happened to touch the barbed-wire border fence were ordered by the Israelis to block up with cement their windows and doors facing Israel and build new doors facing the other way. In an architectural sleight of hand, Palestinian dwellers of, say, 15 Jaffa Road became overnight the family on 23 Alexandria Boulevard. The shiny barbed-wire fence mockingly bisected someone’s fruit orchard. During the 25 April hand-over celebrations at the newly built border terminal, just outside Rafah, the Egyptians let off fireworks. Two of the rockets fired actually burst into brilliant colours high up in the air; the other three ineptly dropped into the orchard, setting apricot trees on fire. Nobody seemed to care – the journalists on both sides were too busy admiring and filming the incandescent rockets of light against the greyish sky, and completely overlooked the subtler meaning of the Israeli-Egyptian peace agreement, which was symbolically acted out on the ground. Persons wounded by Israeli soldiers must pay their own hospital fees. This we learned on a visit to Gaza’s Sha’fa hospital. In addition, they are liable to heavy fines, because being shot at or beaten up by soldiers is, according to the logic of the occupation, a sure sign that one was breaking the law. For this reason, many cases of injury are never reported, for fear of getting into worse trouble with the authorities. In the hospital one learns the many meanings of the term ‘wounded’. We tend to measure the extent of brutality by body counts, not maim- ings; but in addition to the twenty or so unarmed civilians killed by Israelis during March and April, many more (probably several hund- red) adults and children were wounded, maimed and disabled for life. Many blinded, many with mutilated faces, many who will never be able to have children, to breath independently or to digest their food. Outside Sha’fa hospital, near the pavement, crouches the omni- pr~sent military patrol jeep, and a pair of flashy rimless sunglasses scrutinise the passers-by. Curfew was lifted in Jabaliya, and we drove into the camp which hitherto we had only seen from outside. Jabaliya camp – trench town, Palestine; the sandy roads charred with the molten black rubber of burning tyres; rows upon rows of shacks, mud huts, tin huts, breeze- block huts; television aerials. Masses of children playing in the wide open spaces where homes had been destroyed in the early 1970s, during Sharon’s ‘pacification of Gaza’, to make way for the tanks. In the home of the Ghabin family, mourning services were led by a local Imam. According to custom the service should have been held a day earlier, on the seventh day; but the murdered boy’s eleven-year-old sister explains: ‘Well, yes, today is the eighth day, but we couldn’t hold the service yesterday because of the curfew.’ Very simple; the curfew prevented the gathering of friends and relatives, so the Imam issued a dispensation postponing the service to the next day. For the girl, curfew is ‘objective reality’ which at times conflicts with tradition, that’s all. Outside the Ghabins’ home, some fifty metres down the road, the grey- green military jeep, our ubiquitous chaperon, was lying in wait. Rafah, day of withdrawal. The actual ceremony was to be held at noon at the main border terminal on the outskirts of Rafah. Only the Egyptians celebrated this final stage of withdrawal; in Israel it was regarded almost as a national tragedy. Most of the journalists and TV crews had been congregating at the terminal since early morning. In Rafah itself there were few reporters. Salah al-Din Street, named after the liberator of Palestine from the crusaders (known in the West as Saladin), was to be blocked in the middle with barbed wire. Two segments of fence stretched out, one from each side of the street. At noon, they will be joined up with another segment, completing the separation of Rafah-Sinai from Rafah-Palestine. A unit of Israeli soldiers was stationed near the fence to supervise the final division of the town – jobs like disconnecting electricity and telephone lines, drilling holes in the tarmac road for the last segment of barbed-wire fence. The local inhabitants filtered into the street. Women stood in groups and talked, shopkeepers curiously watched the crews at work and the children gathered in a growing multitude. No lessons were held on that day because parents did not want to send their children to school, for fear that at noon they might be left on the wrong side of the fence. There was something like a continual contest between the children, who were moving closer to the fence and the soldiers, who were unsuccessfully pushing them back; a sort of ebb and flow of children and soldiers. The latter looked very tense; they pushed the children back not so much because these were getting in the way of the work on the fence, but because their very presence was felt by the soldiers as a kind of threat. The kids clearly realised this and used every chance to taunt the soldiers, to argue with them and appeared thoroughly entertained by the latter’s manifest nervousness. The border-guards used truncheons and rifle butts to push the children away. When some kids succeeded to slip through, the soldiers pointed their rifles at them and shouted in broken colonial Arabic, ‘Go away! Everyone your home! Go home!’; but the children were persistent. In about half an hour it was as though they had learnt the rules of the new game: push forward, argue with the soldiers, get pushed back and shouted at, turn around and edge forwards again. Suddeny ,pak-pak-pak – the sound of shots reverberated through the whole street. The kids fled and within seconds all the shops were closed down. Four or five soldiers ran down the street, firing single shots in the air. Stones were thrown; I heard them land on the street but I was too far to see them. A few more shots were fired and then a tense silence descended on Salah al-Din Street. Now the pneumatic drill near the fence could be heard clearly, and the barbed wire, as it was drawn from one pole to the other across the road, made an elecrifying sound. Within fifteen minutes, the children were back on the street, the shops had been opened and everything seemed as though life was going back to normal following a minor disturbance. The young people once again moved up to see and the soldiers, feeling threatened as before, pushed them back. I moved away from the soldiers and the fence and stood among the crowd. Then I saw the crowd around me turn around and run, pursued by the soldiers who were firing. Instinctively I realised that I must run with the children, escape the soldiers, take cover. I fled into a half-closed shop where a number of young workers had taken shelter. They let me in. I put my hand on my chest, to signal fear; they smiled. A problem I faced in this as in other encounters with Palestinians in the Strip was one of disguise: I could not speak Hebrew, because then I would have been identified as an Israeli and the people would have been suspicious of me. Neither could I use Arabic, for then my Israeli accent would have betrayed me. Willy-nilly I found myself speaking English. But since most young Palestinians do not understand English well enough, I had to settle for a kind of pidgin English, which I found uncomfortable. My discomfort was compounded by the fact that many of these young people spoke good, idiomatically rich colloquial Hebrew, which they have acquired as workers in Tel-Aviv or in other Israeli towns which attract cheap Palestinian labour. In an encounter with a foreigner who does not speak Arabic, they naturally turn to Hebrew, which for them is the first foreign language. And so I found myself in countless situations in which I was speaking intentionally poor English and answered back in fluent Hebrew, which I pretended not to understand. I recalled the experience of an Israeli friend who had participated in a demonstration held last November in Ramallah by the Israeli Committee for Solidarity with Birzeit University. The demonstrators were assaulted by border-guards, who used tear gas. In the judgement of many Israeli dissidents, that demonstration was a watershed in the history of the Jewish opposition to the occupation, for it signalled an end to the privileged status of Jewish protesters. I do not know whether this judgement is correct, but it is certainly true that many demonstrators were deeply shaken by that experience. My friend stood among the other demonstrators when the tear-gas canisters were fired, but for some reason she felt immobilised, unable to run. She had to be led away by local Ramalla youths who had been watching the entire confrontation from the sidelines. They took her away from the troubled area and gave her a lift to the main Ramallah-Jerusalem road. They instructed her to cover her head with a red kufiyya as a disguise, so that the soldiers would not notice her. She arrived in Jerusalem safely, but deeply shaken. As a patriotic Israeli, she felt disturbed at having to disguise herself as a Palestinian, with a head-dress often associated with PLO guerrillas, in order to escape the Israeli soldiers. I thought of her as I stood in the shop looking out at the occupation in action. The soldiers were running up and down, shooting in the air and lobbing tear-gas canisters into the alleys. The children used every chance, every moment when the coast was clear, to come out of the houses and hurl stones at the street or at the closed shops. Two vehicles bearing Israeli licence plates were demolished in next to no time. The young workers in the shop said to me in broken English: ‘See what they do to us. We shall kill a/-Yahud!’ I had heard similar statements on previous days, and almost as a rule the soldiers were referred to as ‘a/-Yahud’ or ‘the Jewish’. I venture to say that in this context ‘Yahud’ does not mean ‘Jews’ in the general sense of this term. To these Palestinians, ‘a/-Yahud’ means the soldiers, the conquerors, the foreign oppressors. An American friend who had recently visited the Galillee told me that although he persistently introduced himself as an ‘American Jew’, the Palestinian villagers just as persistently referred to him as ‘an American, not a Jew’. The Zionists have made a lot of political capital out of such supposedly antisemitic expressions which are common in Palestinian anti-Israeli rhetoric. But I think that the Palestinians, or at least those young Palestinians who have only known the Israelis as occupiers and oppressors, are merely using the term that the Israelis use when referring to themselves, ‘the Jews’. In the media, in official publications as well as in daily discourse, the Israeli Jews commonly speak of themselves simply as ‘the Jews’ rather than ‘the Israelis’ or ‘Israeli Jews’. To accuse Palestinians of antisemitism because they express hostility towards ‘the Jews’ is to misunderstand their language. It is also to commit slander, by attributing to the Palestinians a uniquely European prejudice and doctrine, a product of European society and culture. When they speak of ‘the Jews’, Palestinians mean their Israeli enemy. On returning to Gaza later that afternoon, we heard that Rafah had been placed under curfew. We visited Jabaliya camp again and spoke to two families whose homes had been demolished. The only remains of what used to be the homes of two ten-member families were the floor tiles and a wall or two. Both homes had been pulled down in the middle of the night, at short notice, because their sons were suspected of ‘terrorism’. In the Israeli-occupied territories, such demolitions are carried out on the basis of suspicion rather than conviction. In theory at least a young man can be held as a suspect, then be fully acquitted in court and sent back to his family whose home has in the meantime been bulldozed. The families are not allowed to rebuild their houses for a number of years. They must therefore live without a roof over their heads; at most, they may put up a tent in which to shelter during the winter rains. Speaking to numerous Palestinians in the camp, I was impressed with a sense of optimism shared by the younger generation of Palestinians. I think that in this they differ from the older generation. I was struck by the extent to which the younger Palestinians, those under 30, showed a subtle understanding of Israeli society, politics and culture. I think they derive this understanding from their daily experiences as manual labourers in Israel. Going to work there, they enter into direct relations of production with Israelis, learn their language and observe them at close quarters, thus gaining a view of Israel stripped of its myth, no longer as an all-powerful monolith but as it really is – a society cracked and riddled with deep conflict, like every class society. In this sense, working in Israel is exercising a profound influence on the minds of the Palestinians; it grants them a view of reality which is potentially revolutionary. Today is Israel’s Day of Independence, and official colonisation ceremonies are being held in eleven new Ma’ahazim (military settlements, later to become civilian) in the occupied territories. One of them, Nahal-Nissanit, is in the north of the Gaza Strip. The speakers were a Jewish Agency official, a senior army officer and a rabbi, representing the trident of contemporary Zionism – land-grabbing, military force and religious indoctrination. The first speaker explains, in broad outline, the colonisation programme for the Gaza Strip. The intention is clear: to surround Gaza with Israeli settlements. The Qatif block, south of Gaza, has been in existence for sometime and the new Nahal-Nissanit is the first of a cluster of settlements planned to watch over Gaza from the north. I turn to one of the soldiers manning what is still a military outpost and ask, ‘Where is the land planned for cultivation by the future settlers?’ He points at the Palestinian citrus groves in the valley below and explains, in all sincerity, ‘On such fallow, uncultivated territory’.